Could this be my next car? I’m having a hard time liking this Mini revision–the reviews have been good, but I have a hard time getting over the C pillars. They just don’t look right to me. The girls would like the extra legroom, though. Mostly loaded S Clubman: just under $31,000. Yesterday we took the girls out on the town for the last day of the long weekend. First stop was brunch at Ike’s on Sixth Street in downtown Minneapolis (whatever happened to their website at ilikeikes.com?). The burgers and fries at Ike’s have long been one of my favorites, so I was excited to try the brunch. Wow. They started off by bringing out a cinnamon pecan roll “as big as your head.” Not quite as large as my big head, but definitely as big as the girls. Then we got to order our eggs (Thing 1 did the make-your-own omelet bar). While we waited for the eggs, our server brought a platter with hash browns, sausages, smoked bacon strips and stacks of buttermilk pancakes. Brunch wrapped up with four hot, fresh chocolate chip cookies. Nicely done and the place was packed (glad I called ahead). After eating, it was off to visit the Mill City Museum again. After re-visiting the very cool Flour Tower, we headed back to the first floor to watch Kevin Kling’s Minneapolis in 19 Minutes Flat movie. These two features might just be the most entertaining history exhibits the MHS has ever produced. Well done! After the movie, we walked the girls over to the new Guthrie so they could check it out for the first time. This also happened to be the last day of performances for Pen and our timing was perfect–our friend Phil Callen was just finishing and we got to say hi after the 1pm show. Wow, two full books in a week! I’ve had a strong interest in Mt. Everest (Chomolungma to the Tibetans or Sagarmatha to the Nepali) for a long time. Some of this was no doubt in part due to the 1996 IMAX film and Jon Krakauer’s book Into Thin Air. My co-worker and I enjoy watching every television show we can find on Everest and followed the Rest of Everest podcast for some time. Needless to say, I love the new Everest ride at Walt Disney World and have “provide tech support at base camp for an Everest expedition” as one of my lifetime to do items. Touching My Father’s Soul: A Sherpa’s Journey to the Top of Everest is written by Jamling Tenzing Norgay, son of Tenzing Norgay (who with Sir Edmund Hillary was the first to reach the summit in 1953). It’s a quick read for 310 pages and provides a lot of background on the 1953 expedition, as well as the 1996 IMAX expedition (which Jamling accompanied). I also liked the Sherpa and Buddhist perspective that is absent in many Everest stories. My friend and former co-worker Hans Erickson (aka Hanz Erik) resurfaced a few weeks ago on iChat. We had a nice discussion about his move to New York City and his current gig at an Internet start-up (Next2Friends). His official title is Content Marketing Director and you can reach him at Hans@Next2Friends.com or read his blog posts here. Awesome covers from a great musician. If you don’t already own it, buy his latest album Copay online at CD Baby or at Cheapo Records in the Twin Cities. It’s a perfect Christmas present for any music lover too! I actually read an entire book in a day and a half this week. We were at the Eagan library, where they had set up a new section on Minnesota books and music. That’s where I found Juicing the Orange: How to Turn Creativity into a Powerful Business Advantage , by Pat Fallon and Fred Senn. This book was an interesting read for me, as I almost went to work for Fallon about eight years ago. I’ve always been impressed with their work and the stories here give some insight into how they function. My favorite anecdote was about Northwest Airlines. Fallon won that account in 1991, but dropped them four years later because they “fostered exactly the kind of toxic atmosphere we had set out to avoid.” I wonder who the top client contact was who “was creative and especially connected in the music world.” He is also described as “domineering and indecisive, a bad combination.” Could this be Chris Clouser? A few weeks ago, the brake pad wear light appeared on my Mini’s dash. After conferring with several Mini-owning friends and colleagues, I decided to give it a go myself. I’m not a mechanic by any stretch, but I didn’t have the will or the money to pay full-price at the dealer (which could have run as much as $1200, from what I’ve been told). Paying $83 for pads sounded like a much better deal. I also spent around $15 on a new brake pad sensor cable, both ordered from Auto Parts Warehouse. The car has almost 50,000 miles and the rotors looked fine to my untrained eye, so I decided to wait on those. The Mini has two brake pad sensors (front left and rear right), so I wasn’t 100% sure which one was triggering the light. Visually, they all looked about the same to me. I started on the front, though, as it is an easier replacement job and usually wears out first. Based on recommendations, I ordered EBC Red Stuff pads and used this online tutorial for guidance. The job went smoothly for the most part–the only difficulty was getting the replacement sensor cable in place. The CRC Disc Brake Quiet junk was a little messy too, but I think I got it applied in the right spots. After I finished, the tutorial was right on about the brake pedal going all the way to the floor. Pumping it a few times returned the feel to normal and my short test drive around the block produced no unusual noises. I drove it to the Wild game and the brake feel was fine. Despite trying the ignition trick with the flat tire button, the damn yellow warning light is still lit. So I either A) didn’t install the replacement cable correctly, B) the new cable is broken, C) I don’t know the “real” trick to turn it off or D) it was back sensor cable all along. I just ordered the special tool kit to compress and twist the rear pistons, so I’ll probably order new rear pads soon and attempt that job too (online tutorial for that here). My first auto mechanic experience has been documented for posterity in the Mini Gallery. The review in the paper didn’t really prepare us for what we actually experienced. I was expecting a grim and dark storyline, but found myself smiling through most of the show. One big twist I totally wasn’t expecting too (I won’t spoil it here). The play runs though November 25–go and see Phil before he returns to New York. Ticket info here. Prices are very reasonable and seats are general admission, so get there early (doors opened 30 minutes before show time on Saturday). I’m really becoming attached to the new building. The 180-seat Dowling Studio space is very special (not to mention hard to find). Here’s a nice local photo site I found that has some shots of the exterior (including the cool yellow overhanging block with the glass floor). Very fun to see the picture of Ian McKellen in the front foyer, too. A fan of his Daily Show appearances, I got to see Lewis Black in person this weekend at Mystic Lake Casino in Prior Lake. He’s even funnier live and uncensored. Every golfer needs to hear the rant he did about golfing–hopefully that will be released on a future CD or DVD. Opener John Bowman was funny also, but he seemed to forget his lines a few times. The new theater at Mystic was very nice, although the crowd flow after the show was awful. They also need to open up the Meadows Grille on show nights-we couldn’t get in to any of the other sit-down restaurants before the show. 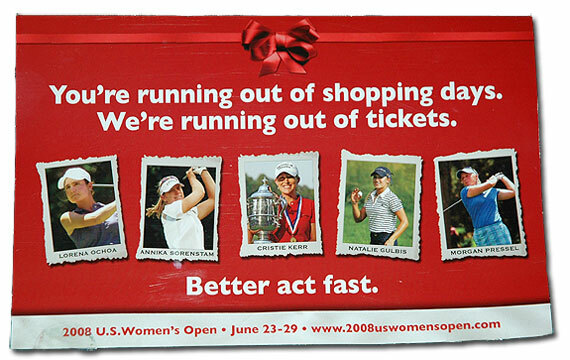 Yesterday I received a flier from the organizers of the 63rd U.S. Women’s Open, which will be held next year at Interlachen Country Club in Edina, June 23-29, 2008. Patty Berg Pavilion and Week Long Grounds Pass tickets are also discounted until the end of the year. These rates are only available online or by phone at 877-281-OPEN (limit four; use code “MNGOLF”). The $95 holiday packages are also available at Cub Foods stores. Watch for a Golfing in Minnesota update on Interlachen’s Open preparations coming soon. I spent last week out at the LA school and got about 80% of the things done that I wanted. It’s almost like time moves twice as fast when you know you have to leave town at a given time. The weather out there was very un-Southern California: cloudy every day with highs around 60 and lows below 50. In hindsight, it was actually very nice, but I would’ve packed different clothes (hence the new sweatshirt I picked up at Downtown Disney). It seems that the air quality had recovered from the recent fires. I ate at a lot of the same places this time, finally trying something new on the last night. The Bluewater Grill was located right on the harbor in Redondo Beach and had some really good seafood. My co-workers had an oyster sampler and swordfish, while I tried some halibut from Alaska. Looks like I’ll be back again in December to wrap up things for the year. Things to Do, #21: Attend the Open Championship.